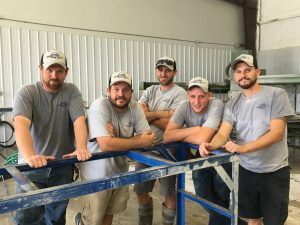 At Edge Stoneworks we strive to bring you the highest quality products and are dedicated to a standard of customer service that is unparalleled. Contact us today to see how our competitive pricing, dedication to customer service, and quality custom products set us apart from the rest! Will you be using tile backsplash or countertop material? If you have overhang we need the approximate depth you would like. We recommend anywhere from 10”-14” depending on your design. We can also provide & install hidden support for these in various lengths. We use a local company to custom make all of our steel support brackets. If you do not have all the details above we can still provide you with a generic quote until your final selections are made, and will be happy to assist you in making all the necessary decisions! Granite, Marble and other Natural Stone is a product of nature and is available in a wide spectrum of colors and patterns. To get an idea of what you like please click here or come by our showroom and we would be more than happy to assist you! When choosing Quartz, samples are your best way to go. These sample colors do not vary from the slab color. We have many samples in our showroom for you to check out and take home. You can also view a wide selection here. 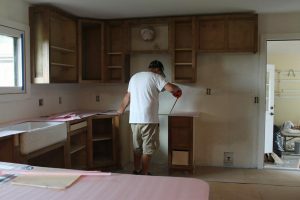 We always measure and template prior to fabricating your countertops. This ensures an exact fit for your custom slab selection. Our professional template techs are equipped to answer any technical questions or concerns you may have, and will work with you to guarantee all specifications and technical details are taken care of. Please click here for our Template Checklist so you can be assured the templating process is conducted efficiently and in a professional manner. Providing you with a timeless quality surface is our goal. 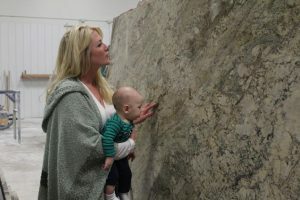 The expertise of the available custom slab products from Edge Stoneworks provides our clients with the knowledge and guarantee of a quality custom product. The fabrication facility utilizes a wide array of machinery for precise cutting and polishing. Skillful blending, matching, and fabrication of the stone slabs result in a beautiful combination of nature’s variety and your custom design. 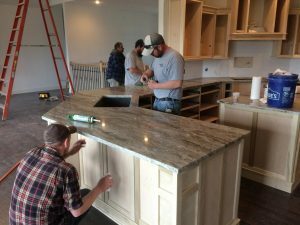 When fabrication is complete, our installation crew will finalize your project and put the final touches on your new custom stone project. Their expertise provides them with the ability to keep the installation clean and accurate. An installation usually takes 2-3 hours, but there are some jobs that take longer to finish, this all depends on the size and complexity of installation. Please click here for our Pre-Installation Checklist so that you can prepare for your new countertops. Please visit our Resources section for more information.